Onkyo's latest stereo does online shopping all by itself. Onkyo Japan 's latest hard-drive-toting home stereo is a feature-packed piece of high-end equipment that should satisfy both the audiophile and the gadget freak in anyone. 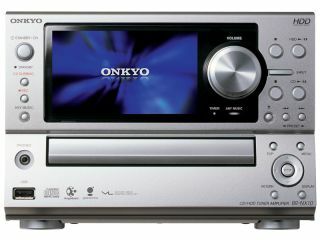 The JPY94,500 (£400) BR-NX10 is part of Onkyo's usual range of quality stereos and includes an 80GB hard drive inside that shiny metal box. The player can decode any of PCM, ATRAC, ATRAC3/ and MP3, whether the tunes are resident on the drive, an attached USB memory key or on a PC attached via the NX10's Ethernet connection. That networking feature is also used to access the Gracenote database to pull down track details, which can be seen on the 5-inch colour screen. The LCD can also be used for online shopping in the Japanese AnyMusic store. Audio output is rated at 19Wx2 and there are two analogue I/O channels along with a single composite video output for connecting a larger screen. Out in Japan in the middle of March, the NX10 is, sadly, unlikely to make it to Europe.